ALL NOMINATIONS: Narrative descriptions should be prepared as a word document, attached to an email along with a nomination form (click to download the form) and forwarded to fcassociationsc@gmail.com. Telephone 910-580-5037. Nominations may require up to six weeks to process. The Finance Corps Association (FCA) sponsors all Finance Corps and institutional awards with the exception of the Distinguished Member of the Regiment (DMR), which is established by AR 600-82 and the Honorary Member of the Regiment (HOR). The links on each award explain each award and the associated selection criteria. Established by the FCA on 31 August 2016 to recognize individuals that have made positive and lasting contributions to the Finance Corp. HOF inductees are automatically selected and recognized as a Goetz Medallion recipient. (1) FCA Lifetime membership is required. Must have had lifetime membership status for three years prior to the year being considered for the award to be eligible for nomination. 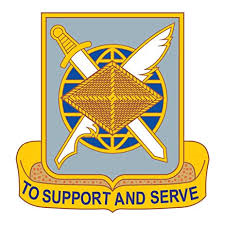 (2) All Army components – former senior commissioned officers, senior noncommissioned officers, or senior civilians with prior Finance Regimental Affiliation. (3) Retired with 26 Years or more of honorable service. If the submitting individual requests exception and provides ample justification, the selection board has the option to waive this requirement. (4) Select Killed in Action (KIA) Soldiers (upon their demise with an unblemished record). (1) Finance Corps General Officer (GO) Board of Directors (BOD) and CSM/SGM Board of Advisors (BOA), the FCA President, and the CSM of the Finance Corps. The voting process is electronic. (2) One-hundred percent (100%) of the board voters must vote in the affirmative for approval of this award. (3) If a member votes no, he or she must provide justification to the FCA president. Each justification is reviewed by the FCA president. (4) After reviewing any no vote justification, the FCA President may request a re-vote by the board. Established by the FCA on 26 March 1999 to recognize individuals of unparalleled leadership and strategic vision: individual must leave an indelible impression on the very essence of the Corps. 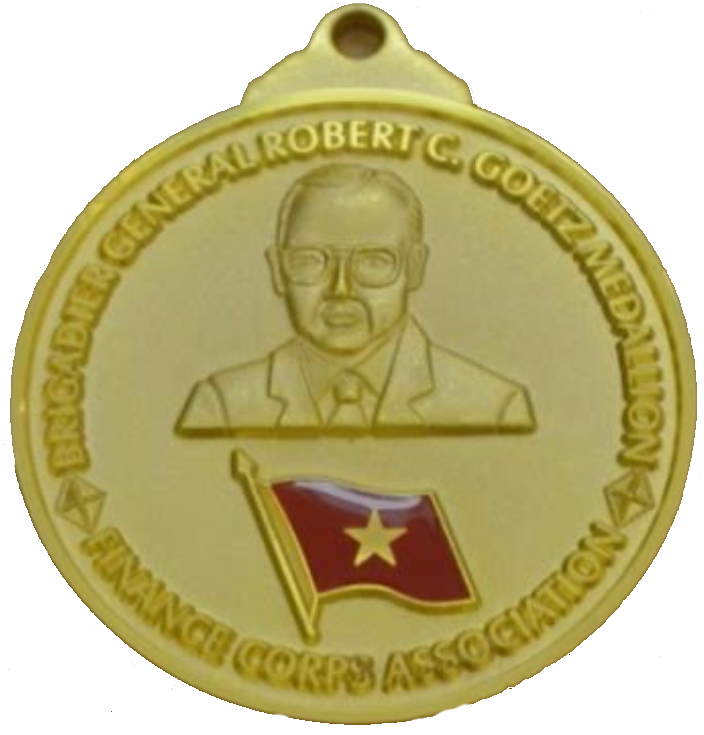 Brigadier General Robert C. Goetz Medallion Criteria. (1) FCA membership is required. Must have had membership status for three consecutive years prior to be considered for the award to be eligible for nomination. 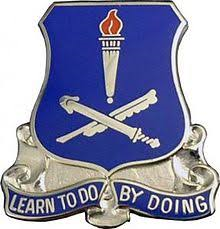 (2) All Army components – present and former finance commissioned officers, noncommissioned officers, enlisted Soldiers, or civilians with prior Finance Regimental Affiliation. (3) Nominee must have 25 or more years’ honorable service. If the submitting individual requests exception and provides ample justification, the board has the option to waive this requirement. (4) Accomplishments must reflect a lifetime of dedication to the Finance Corps’ core values of Patriotism, Integrity, Competence, and Service. (1) Mix of seven GOs, Colonels and Sergeants Major, representing all Components, selected from the FCA membership at large. Upon acceptance, individuals will serve in this capacity for two years. (2) Seventy percent (70%) of the board voters must vote in the affirmative for approval of this award. If a member votes no, he or she must provide justification to the FCA president. Each justification is reviewed by the FCA president. (3) No Overriding Authority – The board’s decision is final. There is no appeal process. Distinguished Member of the Regiment (DMR). The Finance Corps designated the first Distinguished Member of the Regiment and conferred the initial Regimental Medallion on May 5, 1990. The DMR program honors individuals whose legacy of landmark contributions and special acts brings significant credit to the Finance Corps. Distinguished Members of the Regiment display a lasting dedication to the core Finance values of Patriotism, Integrity, Competence, and Service. 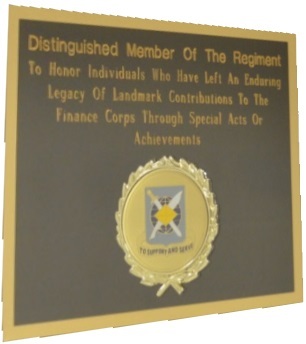 Each awardee receives a distinctive medallion and special Department of the Army certificate, and names of the honorees are engraved on the DMR plaque, which hangs in the Finance School. Eligible for nomination as Distinguished Members of the Regiment are persons from all Army components - present and former finance commissioned officers, warrant officers, non-commissioned officers, enlisted Soldiers, or civilians with prior service in the finance corps. Narrative nomination should provide adequate evidence of the nominated individual whose legacy of landmark contributions and special acts bring significant credit to the Finance Corps. Nominations are limited to one page, .10 font and .05 margin on all sides of the page. Selection committee consists of five individuals from the Active Components, Reserve and National Guard components. 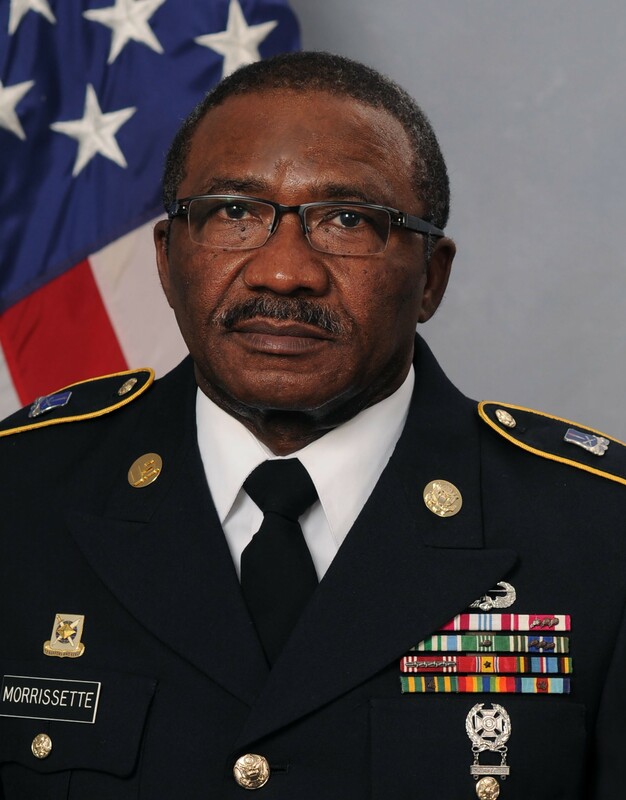 Chief of the Finance Corps and Corps CSM. 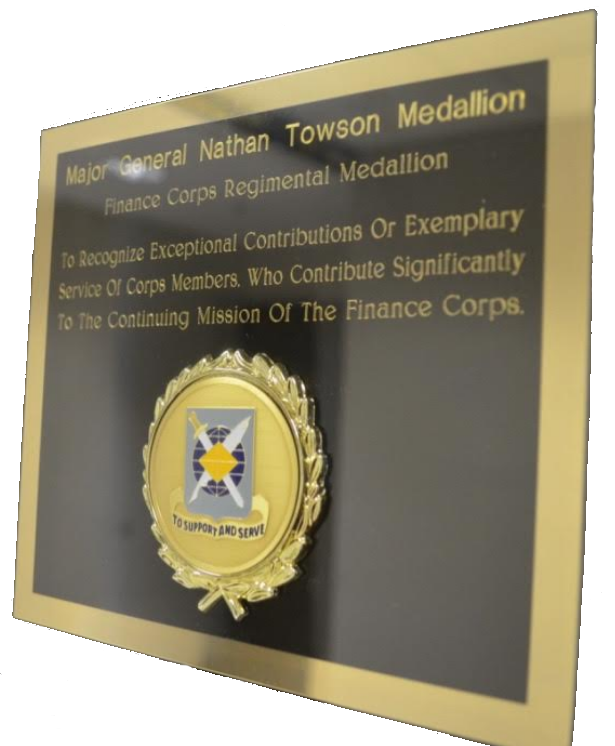 The MG Nathan Towson Regimental Medallion bears the name of MG Nathan Towson who, as Paymaster General 1819-1821 and 1822-1854, envisioned and shaped a financial department, which met the Army's needs until the 20th century. Under his supervision, Army Paymasters assumed responsibility for paying all U.S. troops on an area basis - geographically the world's largest nation - yet Towson's new systems and strict standards of accountability brought costs down and reduced losses to one-fifth of one percent. Established by the FCA on 7 May 1993 to recognize exceptional achievement or exemplary service. Accomplishments must clearly distinguish candidates from their peers. (1) FCA membership is required. Must have had membership status for three consecutive years or a gold member prior to be considered for the award to be eligible for nomination. (2) All Army components – Conferred to ONLY currently serving Finance commissioned officers, noncommissioned officers, enlisted soldiers, and civilians for exceptional leadership. (4) Finance Corps ‘NCO of the Year’ and ‘Soldier of the Year’ are eligible for this award if they are members of the FCA in good standing (i.e. current membership). (5) Leadership award winners for the Finance Captains Career Course and Senior Leaders Course will automatically receive the Medallion. (1) Mix of seven Lieutenant Colonels and Sergeants Major, representing all Components, selected from the FCA membership at large. Upon acceptance, individuals will serve in this capacity for two years. (2) Eighty percent (80%) of the board voters must vote in the affirmative for approval of this award. (3) Overriding Authority is granted to the FCA President, FCA VP and Chief of Staff. The decision to override the board’s vote must be unanimous. 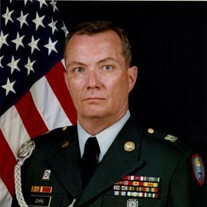 The Finance Corps designated the first Honorary Member of the Regiment on 5 July 1988 to honor those who have made significant professional contributions or have brought great credit to the Finance Corps through special acts or accomplishments. (1) FCA membership is not required for this award. (1) Finance Corps Commandant and Command Sergeant Major. (2) Both must agree for approval to take effect. LTC Lewis L. Hawkins Award. Sponsored by the FCA and first conferred in 1973 to the distinguished leader recipient of the FMCCC. The recipient of the Hawkins Award If the recipient of the Hawkins Award is a member of the FCA in good standing (i.e. current membership), he/she will receive the Towson Medallion. Recipient is the outstanding graduate demonstrating the highest caliber of leadership, professionalism, devotion to duty, and selfless service determined by academic average, physical fitness, course director evaluation, and peer assessment. The FMCCC senior instructor, along with the candidate’s class peers, makes the selection. Sponsored by the FCA and first conferred in January 1991 to the distinguished leader recipient of BOLC. Sponsored by the FCA and first conferred in October 2016 to the distinguished leader recipient of the Senior Leaders Course. The recipient of the Morrissette Award will also receive the Towson Medallion providing he/she is a member of the FCA in good standing (i.e. current membership). The SLC small group leader, along with the candidate’s class peers, makes the selection. Sponsored by the FCA and first conferred in October 2016 to the distinguished leader recipient of the Advanced Leaders Course. The ALC small group leader, along with the candidate’s class peers, makes the selection.